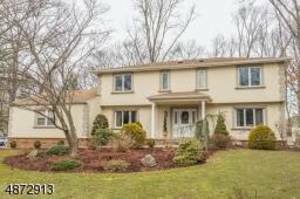 Stunning Colonial ideally situated at end of tree-lined cul-de-sac...boasts curb appeal plus! From the stylish & functional front door Portico to the spindle/oak Staircase that greet you as you enter- this spectacular home will satisfy even the most discerning! Tastefully updated at every turn, including /EIK w/Gran/SubZero Fridge/SS, H/W, Andersen Windows/Doors & newer Hot Water Heater. Family Room and Formal Dining Room directly off Kitchen offer numerous options for entertaining. Second floor en-suite Master w/Closet System, second floor Main Bathroom has been fully renovated w/Jacuzzi Tub & Frameless Glass Shower. Large, Finished Basement w/Powder Rm and plenty of storage. E-N-O-R-M-O-U-S Deck and Rear Yard are an entertainer's dream...Largest lot on the Block!